Whenever I teach a class about the culinary traditions of Diaspora jews, my favorite stop is the Balkan countries. Yes, I love North African and Middle Eastern cuisines with their spice blends and aromas - how could you not? But the Balkans for me are about peppers and eggplant, creamy cheeses and flaky pastries. Whenever the flavors of the Mid East combine with the ingredients of the Balkans - I just can't resist! 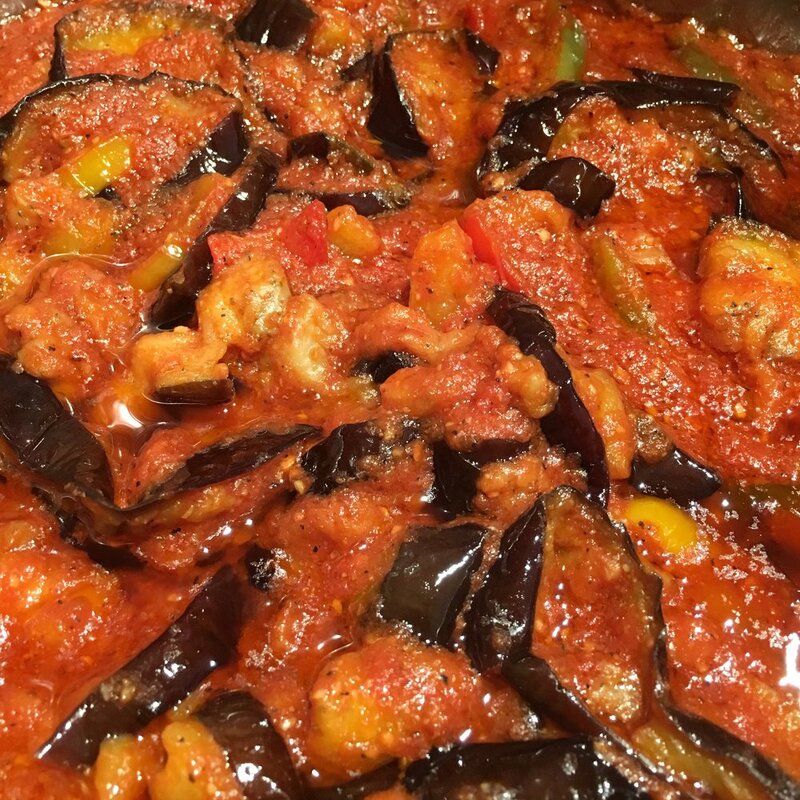 So on this dreary mid-winter, early spring (depending on whether you are a half full or half empty person) here is a great recipe for Balkan eggplant and pepper dish. It is extremely versatile: eat on a cracker for a snack or appetizer (topped with a little feta - how could you go wrong with that? ), over pasta or rice. You can even poach some eggs in it for a Balkan variation of Shakshooka. Roast the eggplant: Heat the oven to 400F. Place the eggplant slices on a rimmed cookie sheet, drizzle tablespoons olive oil over them and season with salt and pepper. Prepare the Sauce: Heat a wide deep skillet on medium heat and add 3 tablespoons olive oil and the pepper slices. Salute the pepper for about 5 minutes until the pepper turn golden. Cook the eggplant: Add the roasted eggplant slices into the sauce, stir them in and cook for 5 minutes longer, for the flavors to meld. Taste and adjust seasoning as needed. Serve: Serve hot or at room temperature. Store: Keep in the fridge in an airtight container for about 1 week.